In addition to the many UFO reports I receive from average observers, I sometimes get reports from people with above average observing abilities. These include pilots, air traffic controllers, police, astronomers and military officers. Debunkers are quick to point out that even people with better-than-average observing abilities make mistakes, so just because a pilot reports a UFO is no reason to automatically assume it’s a spaceship from Neptune. Indeed, UFO databases are chock full of sightings by police and other good observers who were unable to identify stars, planets and aircraft, believing them to be UFOs instead. However, this ignores the facts that this category of observers is very different from those of most other UFO witnesses. First, an experienced observer is used to looking at the sky and making judgment calls about objects that are up there. The difference is best illustrated by many of the Youtube videos posted by UFO buffs in which a distant light is caught moving slowly over a city skyline, leading the videographer to excitedly comment about mysterious orbs, a “scout craft” or dimensional beings manifesting to motivate the witness to proselytize about alien contact. An experienced aircraft observer, on the other hand, would not only know it was an aircraft, but likely be able to discern the type of plane, its configuration, origin, destination and other characteristics. So although experienced observers can and do misinterpret some objects in the sky, the likelihood of their doing so is much lower than that of the typical layperson. Therefore, if a pilot, who is used to seeing lights on other aircraft at night, reports seeing a configuration of lights moving in an unexpected manner or the lights themselves don’t conform to a pattern he or she has seen before, it’s definitely noteworthy. 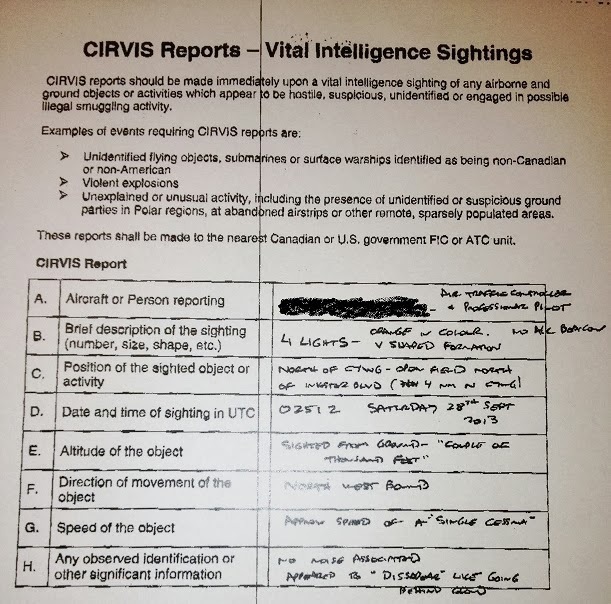 In fact, pilots are required to report sightings of UFOs to authorities, as per the official Rules of the Air (RAC) Manual published by Transport Canada (the Canadian equivalent of the FAA) to which all pilots must conform. unexplained or unusual activity, including the presence of unidentified or suspicious ground parties in Polar regions, at abandoned airstrips or other remote, sparsely populated areas. These reports should be made to the nearest Canadian or U.S. government FIC or ATC unit. According to the manual for flight services, pilots who see UFOs must report them, out of a duty to protect national security and sovereignty. The fact that there is such a regulation implies that there is a need to do so, and that such reports are in fact made. The most recent of these to catch my attention is a report concerning a sighting on Friday, September 27, 2013, at 2051 hrs local (8:51 pm) approximately four kilometres north of the James Richardson International Airport in Winnipeg, Manitoba, Canada. It’s a CIRVIS report filed by an air traffic controller who is also a professional pilot. This person filled out the reporting form thoroughly, and it’s easy to get a sense of what had been seen. The witness was driving on a new freeway that is still not fully completed, circling north of the airport in an area of the city known as Brooklands or Centreport. The witness saw four orange lights in a V-shaped formation, suggesting an aircraft of some kind, except that the witness noted there was “no A/C beacon” visible. The objects were at an estimated altitude of a “couple of thousand feet” and were heading northwest with the “approx. speed of a ‘single Cessna,’” except that they were not making any sound. After a short period of observation, the objects “appeared to ‘dissipate’ like going behind cloud” and were lost to sight. That’s it. The report was sent to NORAD for filing in its own CIRVIS UFO records. Analysis? Well, since it was practically right over a major airport, it would be logical to think it was an aircraft. Not four aircraft, incidentally, since four planes in tight formation over a controlled airspace at night with low cloud ceiling seems a bit unlikely. But one aircraft might be possible. But no beacons or strobes? The other thing to note is the estimated altitude. Most people can’t estimate distance well at night. An air traffic controller usually can, however. So the choices we have now, given the available information, are that the object with four lights was either a conventional aircraft with an odd (and illegal) configuration of lights, or it was something else. By definition, a UFO. And I sure hope that this air traffic controller wasn’t hallucinating, as some debunkers occasionally suggest. I might be on a plane when he or she is manning the radar screens next time, and I would prefer that my plane not be a figment of anyone’s imagination.